Controllers ready to run out of the box. 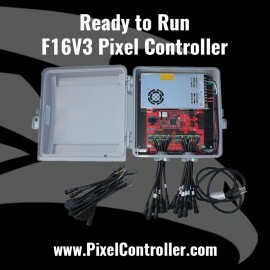 Ready To Run Controllers There is 1 product. Completely Assembled ready to run F16V3 pixel controller. 1024 pixels per output. Includes: MeanWell 350W 12V or 5V Power Supply, CG-1500 Enclosure, Pigtails, 3-wire Power Cable, Cat5e Cable, Cat5e Coupler and Falcon Mounting Plate. Note: Image is of F16V2R. Product will ship with the new F16V3.